There’s no doubt Bob and Paula Crane had only a vague idea of their future when they married just after high school at age 18. 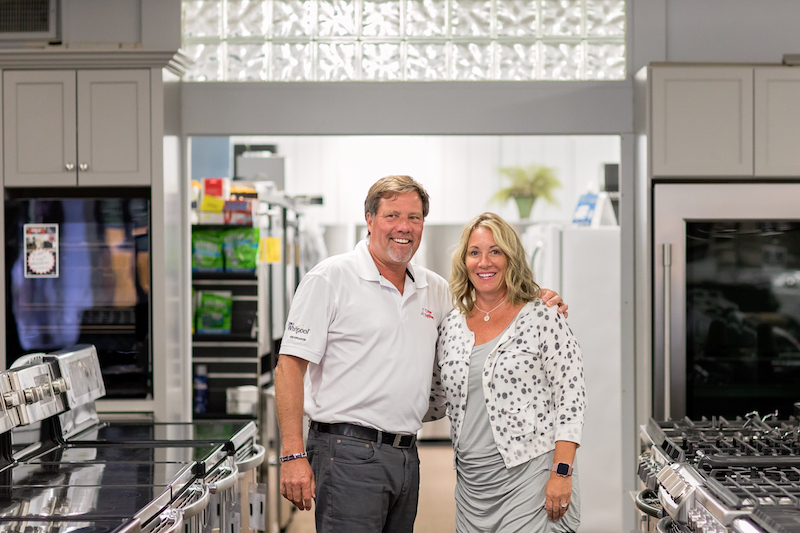 But 37 years and two children later, they’ve built the highly successful business, Crane Appliance, “on Bob’s father’s coattails,” as they both say. With stores now in Falmouth, Orleans and Vineyard Haven, and a distribution center in Cataumet, they are delighted but still a bit surprised at what they’ve managed to do. Q. What do you mean by Bob’s father’s coattails? A. Bob: When I was growing up in Falmouth, my father worked as a sales rep for KitchenAid. His territory was all of the east coast, from Florida to Maine. And on the side he opened an appliance service business. My brother and I worked for him after school and during the summer. When we eventually opened our business, we rode on his good reputation for service. Q. How did your business start? Paula: And of course Bob would recommend a KitchenAid. But in Falmouth there were only GE and Sears products available. So he would go to different dealers he had relationships with, we’d throw the baby in the car, and come back hauling this KitchenAid dishwasher. And the next night, he would install it. Bob: Soon we were bringing truckloads down from Boston. Paula: We both said this is crazy, we can’t keep doing this! We should open a store in Falmouth. And that’s really how Crane Appliance came to be. Bob: Paula and I opened up our own store in 1983. Q. So when and how did you get to the Island? A. Bob: As our business grew, people were coming to Falmouth from the Island. We were doing so much work, shipping stuff to the Island we said, “Hey we have to service those appliances, so let’s do a store there.” When Mid Cape closed its store (where Crane is located in Vineyard Haven), we decided to take it over. Paula: We bought a house on the Island in 2000 when we opened the store here. We spent summers here from 2000 on because we couldn’t find a part time salesperson. Bob had to take over the sales on the floor. Bob: Soon the kids no longer wanted to come home to the Falmouth house. It was always, “Let’s go to the Island.” So we sold Falmouth and moved here. Q. So now, what would you say is your biggest challenge in running the business? A. Bob: Lack of help — that’s our biggest challenge. That and customer service. Here on the Island, in July and August, people are screaming at us because we can’t get to them fast enough to fix their products. We have enough sales help, but getting knowledgeable technicians is difficult. The schools are shutting down training programs. So we are taking our young delivery drivers who show an interest and sending them to school all winter long, training them to become technicians. We are giving them careers. They go from making $18 an hour to $30 an hour. It’s working out successfully. Q. Tell me something you think people may not know about Crane Appliance. A. Paula: That we both work in the business. I do all the policy and procedure work, I oversee the books, and he is hands-on with customers. I call myself “Smokey the Bear” because I prevent fires, and I call him the firefighter because he puts them out. Bob: I tell people, “Hey, I walk these streets every day. If you have a problem, I want to know about it. Call and ask for me!” There is nothing that has happened or will happen that hasn’t already happened. We can solve that. Q. What’s your greatest satisfaction? A. Bob: I find satisfaction in the day to day. I love every busy summer day, especially. I am the first in and the last to leave and I enjoy that, making everybody happy. Paula: Making customers happy is our greatest satisfaction. That’s what we’re here for. Paula Lyons is a former ABC and CBS television consumer journalist.